Sir John Gardner Wilkinson (1797-1875) pioneered modern Egyptology and is best known for his Egyptian surveys with their detailed watercolours. His contributions to the subject earned him numerous honours as well as fellowship of the Royal Society. Wilkinson's passion for exploration led him to travel widely in Europe and the Mediterranean. In 1844, he toured Dalmatia and Montenegro, which were little-known regions in the nineteenth century. Dalmatia, a historical region of Croatia located on the eastern coast of the Adriatic Sea, was then a province of Austria and torn by ethnic conflicts. During his trip, Wilkinson gathered a significant amount of information about regional customs, architecture, history and language. This illustrated two-volume account of his travels was first published in 1848. 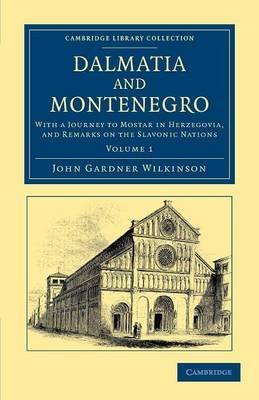 Volume 1 charts the physical features and cultural traditions of the area, with a substantial chapter devoted to Montenegro.